Several related species are marketed under the general name of Tetraodon; T. palembangensis is known as the figure-eight puffer. When threatened, all species can inflate their bodies with air and water to intimidate the enemy; they have teeth, and can feed on mollusks and crustaceans. 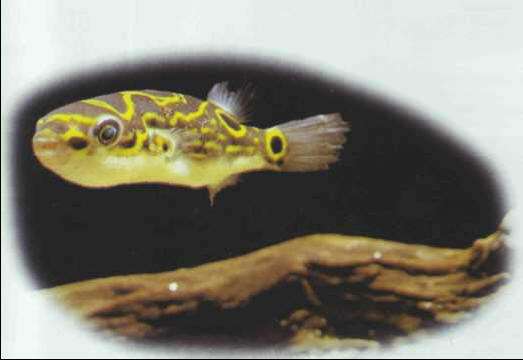 Tetraodon reticulatus (reticulated puffer) is aggressive and frequents distinctly saline waters. It accepts live prey or meat-based foods; it is not known to breed in captivity. Size: 8-10 cm.